This test has 81 questions from the DVSA revision question bank about responding to other vulnerable road users such as cyclists and pedestrians. The average score for this test is 90%. Can you beat that? These markings are found on the road outside schools. DO NOT stop (even to set down or pick up children) or park on them. The markings are to make sure that drivers, riders, children and other pedestrians have a clear view. Parking here would block the view of the school entrance and would endanger the lives of children on their way to and from school. You must show consideration to other road users. The reactions of older drivers may be slower and they might need more time to deal with a situation. Be tolerant and don’t lose patience or show your annoyance. This sign shows a shared route for pedestrians and cyclists: when it ends, the cyclists will be rejoining the main road. If you’re waiting to emerge from a side road watch out for motorcycles: they’re small and can be difficult to see. Be especially careful if there are parked vehicles restricting your view, there might be a motorcycle approaching. IF YOU DON’T KNOW, DON’T GO. These markings are used outside schools so that children can see and be seen clearly when crossing the road. Parking here would block people’s view of the school entrance. This could endanger the lives of children on their way to and from school. If a motorcyclist is travelling slowly it may be that they are looking for a turning or entrance. Be patient and stay behind them in case they need to make a sudden change of direction. Motorcycles are small vehicles and can be difficult to see. If the rider wears bright clothing it can make it easier for other road users to see them approaching, especially at junctions. Always look out for motorcyclists, and cyclists, particularly at junctions. They are smaller and usually more difficult to see than other vehicles. Be courteous and prepare to stop. 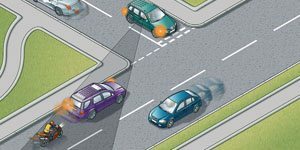 Do not wave people across as this could be dangerous if another vehicle is approaching the crossing. Take extra care as the pedestrian may not be aware of vehicles approaching. Horse riders often keep to the outside of the roundabout even if they're turning right. Give them plenty of room and remember that they may have to cross lanes of traffic. A last check in the offside mirror and blind spot will allow you sight of any cyclist or motorcyclist overtaking as you wait to turn. There could be a motorcyclist riding along the outside of the queue. Always check your mirror before turning as situations behind you can change in the time you have been waiting to turn. Motorcyclists and cyclists are often more difficult to see on the road. This is especially the case at junctions. You may not be able to see a motorcyclist approaching a junction if your view is blocked by other traffic. A motorcycle may be travelling as fast as a car, sometimes faster. Make sure that you judge speeds correctly before you emerge. On a quiet country road always be aware that there may be a hazard just around the next bend, such as a slow-moving vehicle or pedestrians. Pedestrians are advised to walk on the right-hand side of the road if there is no pavement, so they may be walking towards you on your side of the road. Never attempt to change direction to the right without first checking your right-hand mirror. A motorcyclist might not have seen your signal and could be hidden by the car behind you. This action should become a matter of routine. Wait until the pedestrian has passed, then look around again before you start to reverse. Don’t forget that you may not be able to see a small child directly behind your vehicle. Be aware of the possibility of hidden dangers. Cycling in today’s heavy traffic can be hazardous. Some cyclists may not feel happy about crossing the path of traffic to take up a position in an outside lane. Be aware of this and understand that, although in the left-hand lane, the cyclist might be turning right. Give pedestrians who are walking at the side of the road plenty of room when you pass them. They may turn around when they hear your engine and unintentionally step into the path of your vehicle. If you see a motorcyclist take a quick glance over their shoulder, this could mean they are about to change direction. Recognising a clue like this helps you to be prepared and take appropriate action, making you safer on the road. The people on the walk should be keeping to the left, but don’t assume this. Pass slowly, make sure you have time to do so safely. Be aware that the pedestrians have their backs to you and may not know that you’re there. Toucan crossings are shared by pedestrians and cyclists and they are shown the green light together. Cyclists are permitted to cycle across. The signals are push-button operated and there is no flashing amber phase. The interior mirror of most vehicles can be set to the anti dazzle position. You will still be able to see the lights of the traffic behind you, but the dazzle will be greatly reduced. Check that it’s clear before you turn into a junction. If there are pedestrians crossing they have priority, so let them cross in their own time. Vehicles that are used to carry children to and from school will be travelling at busy times of the day. If you’re following a vehicle with this sign be prepared for it to make frequent stops. It might pick up or set down passengers in places other than normal bus stops. If you see a bus ahead watch out for pedestrians. They may not be able to see you if they’re crossing from behind the bus. As you look through the rear of your vehicle you may not be able to see a small child. Be aware of this before you reverse. If there are children about, get out and check if it is clear before reversing. If you’re turning into a side road, pedestrians already crossing the road have priority and you should give way to them. Don’t wave them across the road, sound your horn, flash your lights or give any other misleading signal. Other road users may misinterpret your signal and this may lead the pedestrians into a dangerous situation. If a pedestrian is slow or indecisive be patient and wait. Don’t hurry them across by revving your engine. Older people may have impaired hearing, vision, concentration and judgement. They may also walk slowly and so could take a long time to cross the road. Where street repairs have closed off pavements, proceed carefully and slowly as pedestrians might have to walk in the road. With people’s concern today for the environment, cycle routes are being created in our towns and cities. These are usually defined by road markings and signs. Respect the presence of cyclists on the road and give them plenty of room if you need to pass. Where there are yellow zigzag markings, you should not park, wait or stop, even to pick up or drop off children. A vehicle parked on the zigzag lines would obstruct children's view of the road and other drivers view of the pavement. Where there is an upright sign there is mandatory prohibition of stopping during the times shown. Pedestrians and riders on two wheels can be harder to see than other road users. Make sure you look for them, especially at junctions. Good effective observation, coupled with appropriate action, can save lives. Always look into the road into which you are turning. If there are pedestrians crossing, give way to them, but don’t wave or signal to them to cross. Signal your intention to turn as you approach. The picture of a cycle will also usually be painted on the road, sometimes with a different coloured surface. Leave these clear for cyclists and don’t pass too closely when you overtake. If you cannot be sure whether there is anything behind you, it is always safest to check before reversing. There may be a small child or a low obstruction close behind your car. The shape and size of your vehicle can restrict visibility. Beware of children playing in the street and running out into the road. If a ball bounces out from the pavement, slow down and stop. Don’t encourage anyone to retrieve it. Other road users may not see your signal and you might lead a child into a dangerous situation. Be aware that older people might take a long time to cross the road. They might also be hard of hearing and not hear you approaching. Don’t hurry older people across the road by getting too close to them or revving your engine. Another road user failing to see a motorcyclist is a major cause of collisions at junctions. Wherever streams of traffic join or cross there’s the potential for this type of incident to occur. As you approach the vehicle, assess the situation. Due to its slow progress you will need to judge whether it is safe to overtake. In this situation motorcyclists could be passing you on either side. Always check before you change lanes or change direction. When you’re on country roads be aware of particular dangers. Be prepared for farm animals, horses, pedestrians, farm vehicles and wild animals. Always be prepared to slow down or stop. If a school crossing patrol steps out into the road with a stop sign you must stop. Don’t wave anyone across the road and don’t get impatient or rev your engine. They will have a flashing amber light. Powered vehicles used by disabled people are small, low, hard to see and travel very slowly. On a dual carriageway a flashing amber light will warn other road users. Before overtaking assess the situation. Look well ahead to see if the cyclist will need to change direction. Be especially aware of the cyclist approaching parked vehicles as they will need to alter course. Do not pass too closely or cut in sharply. If you’re following a cyclist who’s signalling to turn right at a roundabout leave plenty of room. Give them space and time to get into the correct lane. If you want to turn right from a junction and your view is restricted, STOP. Ease forward until you can see – there might be something approaching. IF YOU DON’T KNOW, DON’T GO. These are known as advanced stop lines. When the lights are red (or about to become red) you should stop at the first white line. However if you have crossed that line as the lights change you must stop at the second line even if it means you are in the area reserved for cyclists. The flashing amber lights are switched on to warn you that children may be crossing near a school. Slow down and take extra care as you may have to stop. If you want to turn left and there’s a cyclist in front of you, hold back. Wait until the cyclist has passed the junction and then turn left behind them. Learning is a process of practice and experience. Try to understand this and this process. Motorcyclists often overtake queues of vehicles. Make one last check in your mirror and your blind spot to avoid turning across their path. Learners might not have confidence when they first start to drive. Allow them plenty of room and don’t react adversely to their hesitation. We all learn from experience, but new drivers will have had less practice in dealing with all the situations that might occur. You should always stop at the first white line. Avoid going into the marked area which is reserved for cyclists only. However if you have crossed the first white line at the time the signal changes to red you must stop at the second line even if you are in the marked area. Be particularly careful when approaching horse riders – slow down and be prepared to stop. Always pass wide and slowly and look out for signals given by horse riders. Horses are unpredictable: always treat them as potential hazards and take great care when passing them. Allow the horse rider to enter and exit the roundabout in their own time. They may around the roundabout. Don’t get up close behind or alongside them. This is very likely to upset the horse and create a dangerous situation. Cyclists approaching a roundabout in the left-hand lane may be turning right but may not have been able to get into the correct lane due to the heavy traffic. They may also feel safer keeping to the left all the way round the roundabout. Be aware of them and give them plenty of room. Watch out for children crossing the road from the other side of the bus. At a pelican crossing the green light means you may proceed as long as the crossing is clear. If someone hasn’t finished crossing, be patient and wait for them. The flashing amber light allows pedestrians already on the crossing to get to the other side before a green light shows to the traffic. Be aware that some pedestrians, such as elderly people and young children, need longer to cross. Let them do this at their own pace. Passing the moped and turning into the junction could mean that you cut across the front of the rider. This might force them to slow down, stop or even lose control. Slow down and stay behind the moped until it has passed the junction and you can then turn safely. Always check the road into which you are turning. Approaching at the correct speed will allow you enough time to observe and react. Give way to any pedestrians already crossing the road. Slow down and be ready to stop if you see animals in the road ahead. Animals are easily frightened by noise and vehicles passing too close to them. Stop if signalled to do so by the person in charge. A motorcycle can be lost from sight behind another vehicle. The use of the headlight helps to make it more conspicuous and therefore more easily seen. If you’re driving in high winds, be aware that the conditions might force a motorcyclist or cyclist to swerve or wobble. Take this into consideration if you’re following or wish to overtake a two- wheeled vehicle. Don’t pass cyclists too closely as they may need to veer around a pothole or other obstacle, be buffeted by side wind, or be made unsteady by your vehicle. Always leave as much room as you would for a car, and don’t cut in front of them. Make allowances for cyclists. Allow them plenty of room. Don’t try to overtake and then immediately turn left. Be patient and stay behind them until they have passed the junction. Scan the road as you drive. Try to anticipate hazards by being aware of the places where they are likely to occur. You’ll then be able to react in good time, if necessary. By always staying close to the vehicle in front. By never going over 40 mph. By staying only in the left-hand lane on all roads. New drivers and riders are often involved in a collision or incident early in their driving career. Due to a lack of experience they may not react to hazards as quickly as more experienced road users. Approved training courses are offered by driver and rider training schools for people who have passed their test but want extra training. Even if the lights turn to green, wait for them to clear the crossing. Allow them to cross the road in their own time, and don’t try to hurry them by revving your engine. If you need to reverse into a side road try to find a place that’s free from traffic and pedestrians. Look all around before and during the manoeuvre. Stop and give way to any pedestrians who want to cross behind you. Avoid waving them across, sounding the horn, flashing your lights or giving any misleading signals that could lead them into a dangerous situation. Horses and their riders will move more slowly than other road users. They might not have time to cut across heavy traffic to take up positions in the offside lane. For this reason a horse and rider may approach a roundabout in the left-hand lane, even though they’re turning right. There are some crossings where cycle routes lead the cyclists to cross at the same place as pedestrians. These are called toucan crossings. Always look out for cyclists, as they’re likely to be approaching faster than pedestrians. You should slow down and be prepared to stop as you would with an able-bodied person. Don’t wave them across as other traffic may not stop. The markings are there to show that the area must be kept clear to allow an unrestricted view for approaching drivers and riders, and children wanting to cross the road. Cyclists and motorcyclists are smaller than other vehicles and so are more difficult to see. They can easily become hidden from your view by cars parked near a junction. We'll email you a different test every day for two weeks to help you ace your test.